A 100% waterproof system designed to eliminate the hassle of dangling wires. My name is Jeff Schermerhorn. I started swimming competitively at age 11. I know the dedication required and the difficulties of maintaining a persistent training schedule. Swimming can be a cold and lonely sport. My daughter is a swimmer as well. One night she made a statement that set my mind in motion. She said: “Dad, I wish I could listen to music as I swim.” Well, that was all it took for me to see the value of having a Aquatic Audio System specifically designed for the competitive and serious swimmer. There are waterproof MP3 Players and radios on the market, but none are specifically designed for the serious swimmer. They are more for recreational water sports. The MultiSport Audio System is designed to enhance and accommodate the rigors of the competitive athletes training. This system uses a small waterproof Mp3 player, Patented Headband and patent pending Goggles. 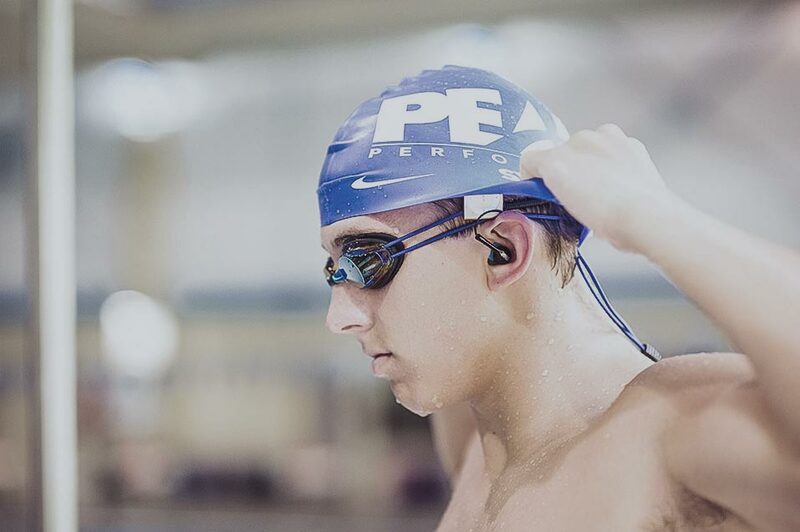 We also have a specially designed swimming cap that completely covers the ears to hold the ear buds securely and help prevent water from dampening the audio quality. This system allows the competitive swimmer to dive, do flip turns, and swim difficult strokes, such as butterfly, with minimal interruption of the sound quality. It is also a multisport audio system for triathletes or any other activity that you want to listen to music. Get ready to train harder, swim faster, and go longer with the MultiSport Audio System, MŪSA. Sign up for our email newsletter and you’ll be the first to know about upcoming sales, promotions & surprises.